This review is based on a sample supplied by the winery or another organization working on their behalf. This is a blend of 67% Syrah, 24% Merlot, and 9% Malbec. The wine was aged in French and American oak for 10 months. The alcohol by volume is 13.5% and there is 8g/L of residual sugar. This wine was sampled as part of a ToastCentralCoast WineChat on Twitter hosted by the winery. I think most readers of my blog know the sometimes turbulent history of the iconic Robert Mondavi Winery. Since the scope of this piece is their “Private Selection” line of wines, I’ll showcase that part of the winery’s history. Robert Mondavi developed a deep appreciation for the distinctive vineyards of California’s coast during the course of decades sourcing fruit from the region. In 1994, Robert Mondavi Private Selection wines was founded with this appreciation in mind, and a mission to exclusively draw from North and Central Coast appellations, showcasing the high quality and varied character of these grapes. The allure of the California coast is simple: it is a region of tremendous varietal quality and versatility that can be used by a winemaker much as an artist uses a broad palette to blend color and create a remarkable finished piece. In this case, the result is a high quality, affordable fine wine born of the best of California’s diverse growing regions. 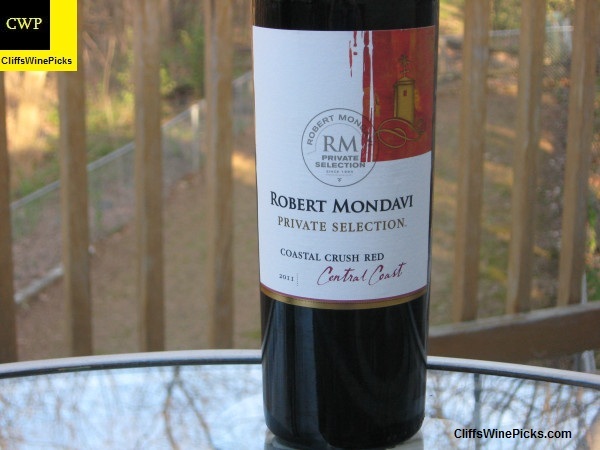 Robert Mondavi Private Selection produces Chardonnay, Cabernet Sauvignon, Merlot, Pinot Noir, Pinot Grigio, Sauvignon Blanc, Fume Blanc, Syrah, Zinfandel and Riesling. These wines – from light and lively to full-bodied and concentrated – have approachable bright fruit expression and exceptional balance, as well as great depth and texture. All are crafted to be enjoyed upon release. The wine is a medium to dark ruby color. The very fruity nose has strawberries, black cherries, spice, licorice, chocolate, and some black pepper. This has medium body with soft, ripe tannins, decent acidity, and just a touch of residual sugar. This has big, sweet, juicy fruit on the palate but with some air, licorice, spice and chocolate join in making it an easy drinking wine. The finish has nice length with a bit extra spice adding some depth. This is an easy drinking wine that would be perfect to share with friends or relatives over the upcoming holiday season.